Community listening forums provide an opportunity to raise awareness about important issues and develop support for taking action. 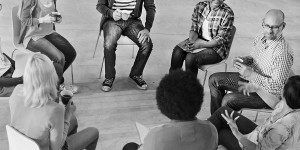 This PDF toolkit provides sample flyers, agendas, evaluations and training materials for speakers to help you organize a forum or town hall meeting to support recovery in your community. If you are interested in organizing a Community Listening Forum, you may be able to collaborate with an organization in your town to host and/or sponsor a community listening forum. A partnering organization may have a meeting room that you could use as well. Read through the fifteen steps designed to help you organize and implement a community listening forum. The appendices will provide you with even more resources to host a community listening forum, including logistics check lists and planning templates, speaker invitation letters, and sample flyers. Any parent or community member who is interested in engaging their community and providing a forum to discuss topics related to substance use and recovery. This Toolkit was developed with support from the Substance Abuse and Mental Health Services Administration (SAMHSA) of the US Department of Health and Human Services, leading public health efforts to advance the behavioral health of the nation.